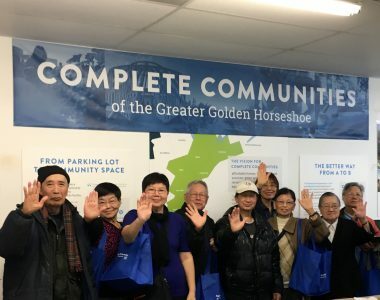 These age-friendly pedestrian safety workshops aim to increase the safety of older pedestrians in Hamilton by building capacity and educating residents around the use of new pedestrian crossovers and signalized intersections. The workshops involve interactive presentations for older people held in their local communities, which include a video developed by the City of Hamilton on the use of pedestrian crossovers and sidewalks. The goals of these workshops are raising awareness and developing skills among vulnerable road users (for example, older pedestrians); increasing the number of older people who walk to get around their communities safely; and decreasing pedestrian injury and fatalities of vulnerable road users, such as older pedestrians. These workshops also provide opportunities for socialization through the interactive presentations that encourage older residents to get together and be a part of local social networks and activities. How collaboration worked: These workshops are a collaboration of the City of Hamilton (Public Works, Public Health, Age Friendly Hamilton), the Seniors Advisory Committee, Hamilton Council on Aging and McMaster University's School of Rehabilitation Science. Initial funding for workshops came from the provincial government's Seniors Community Grant Program. The workshops are now ongoing through continued collaboration. Details on older people's involvement: Older adults identified the need for more education and awareness, and helped to develop the workshops. Positive feedback. Participants stated they gained knowledge and felt their feedback around the importance of safe streets was well received and respected. We have already started to expand these workshops by targeting specific older people's groups in locations throughout greater Hamilton. Targeting specific older people's groups resulted in a greater number of participants in all workshops. Also, offering translation services for specific workshops resulted in greater participation by targeting diverse communities. Recruiting random participants initially resulted in a lower number of workshop participants. A better approach was targeting specific older people's groups for the workshops, which resulted in a higher number of participants.